- D 98202 : "The Dutchman's Secret", from 1999, by Don Rosa (by name only). Eusebio Francesco Chino (also spelt Kino, Chini or Kühn) was born August 10, 1645, in Segno, Tirol, now Italy, the only son of Francesco Chini and Margherita Lucchi. He worked on the family farm at Moncou, Italy until it was sold in 1660. Educated in Germany in mathematics and astronomy, he entered the Society of Jesus in 1665. In March, 1678, he received notice that he was to be assigned to the missions of the Spanish empire. He left Italy for Spain, where he taught mathematics at Jesuit colleges in Seville and Puerto Santa Maria, while awaiting an America-bound armada. He learned Spanish, Portuguese, and made scientific instruments for use in the missions. In 1681, he arrived in Veracruz, Mexico. He explored California and made maps. Since 1686, he has established a lot of missions, inland in Sonora with much success in Christianizing the natives. Gardens and cattle-raising were established, river lands were cleared and planted, and chapels were built. Padre Eusebio Chino founded numerous missions in the Pimería Alta region, now divided between the Mexican state of Sonora and the U.S. state of Arizona. He built more than thirty churches and baptized more than 4,500 persons. He learnt the Pimas how to keep their riches from the European invaders. He died in Magdalena, Sonora, on March 15, 1711. Jesuits have been expulsed from America in 1767. In "The Dutchman's Secret", the Ducks found that the Peralta Sombrero Mines, which also were the Lost Dutchman Mines, were in fact first discovered by Eusebio "E.F.C." 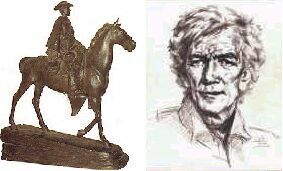 Francesco Chino, during one of his missions, and that he learnt the Pima Indians to keep the gold from the invaders. 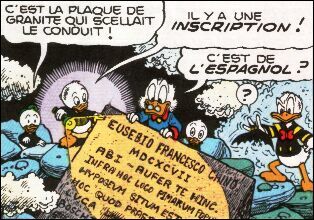 In the mines, a slab with his name and latin inscription is found and translated by the Ducks.